Supercharged Food for Kids will inspire you to create fresh, wholesome and nutrient-rich meals that your children will enjoy again and again, giving them the energy and nourishment they need to thrive. You'll find recipes here that will please even the pickiest of little eaters! With advice on how to avoid added sugar and processed foods, eating for allergies and intolerances, tips for busy families and even the lowdown on how to sneak superfoods into everyday meals, this book is full of resources to help establish positive eating habits for your kids that they can maintain for the rest of their lives. Supercharged Food for Kids features old favourites such as pizza, nuggets, pasta and desserts reinvented using fresh, healthy ingredients, plus ideas for yummy snacks and school lunches that kids will actually want to eat. Think Cauliflower Mac and Cheese, Cacao Bomb Crackles, Cheesy Mini Tartlets, Crunchy Chicken Drummers, Watermelon Icy Poles and Savoury Breakfast Muffins, just for starters. 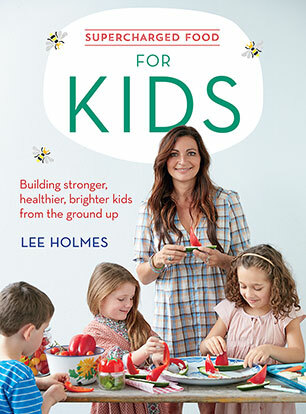 Lee Holmes holds an Advanced Certificate in Food and Nutrition and is a certified holistic health coach (IIN), yoga teacher, wholefoods chef and bestselling author of the Supercharged Food series, which includes Eat Your Way To Good Health; Eat Yourself Beautiful; Eat Clean, Green and Vegetarian; Heal Your Gut; and Eat Right For Your Shape. She is a columnist for Wellbeing Magazine and Lifestyle Food Channel's Healthy Eating Expert, and her articles have appeared in leading Australian newspapers and journals, as well as The Times and The Daily Express in the UK and The Huffington Post in the US. Find Lee at her award-winning blog, superchargedfood.com.